As our region’s homebuilding industry continues its uptick in growth, so does the need for staying on top of regulations, trends and best practices. 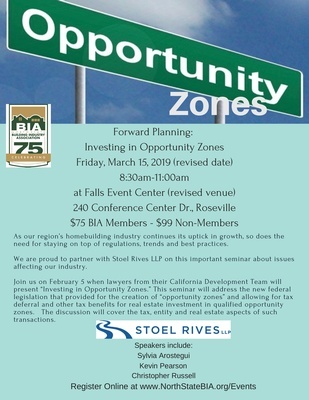 We are proud to partner with Stoel Rives LLP on this important seminar about issues affecting our industry. Join us on March 15 when lawyers from their California Development Team will present “Investing in Opportunity Zones.” This seminar will address the new federal legislation that provided for the creation of “opportunity zones” and allowing for tax deferral and other tax benefits for real estate investment in qualified opportunity zones. The discussion will cover the tax, entity and real estate aspects of such transactions.